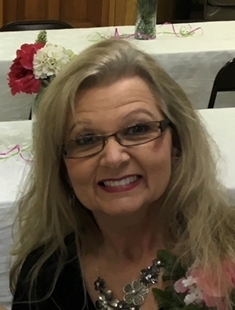 Valerie Lynn Morgan Popham, 56, of Folkston, GA passed away March 16, 2019. She was born February 19, 1963 in Folkston, GA. She was a member of Camp Pinckney Baptist Church, Langfield Hunting Club and the Joyful Intercessors Sunday School Class. She was a diehard Georgia Dawg fan and NASCAR enthusiast. She was preceded in death by her father: Fenton Morgan. She is survived by her husband: Andrew C. Popham, Sr.; 2-Daughters: Kayla Brooke Chancey (Joe Bell) and Kassidy Lauren Chancey (Jordan McCarty); her mother: Geraldine Knowles Butts; a grandson: Ryder Scott McCarty; a step-son: Andrew C. Popham, Jr. (Megan); a sister: Gayle Register (Dennis) and a niece: Anna Register. Funeral services will be held Wednesday, March 20 at Camp Pinckney Baptist Church at 11:00 AM with Rev. Tim Hall officiating. The family will receive friends an hour prior to the service at the church. Burial will be in the church cemetery. Pallbearers will be Robert Johns, Jessie Nettles, Donnie Popham, Garrett Johnson, Andy Knowles and Minter Garvin, Jr.